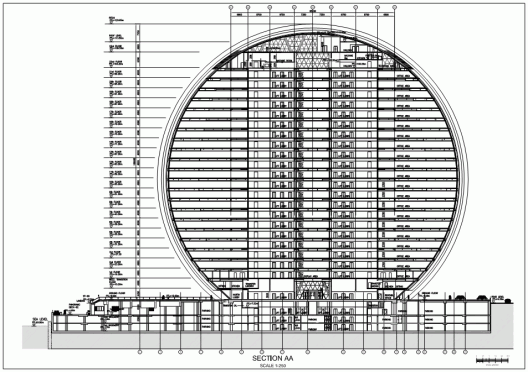 Aldar headquarters building is the first circular building of its kind in the Middle East. It is located in Al Raha, Abu Dhabi (emirate), United Arab Emirates. The distinctive building was voted the “Best Futuristic Design” by The Building Exchange (BEX) Conference held in Spain. The shape of this building is achieved through the use of structural diagrid, a diagonal grid of steel. The client needed the vision of the building to be made into a reality in a very short time. Having Arup as the lead consultant enabled a close working relationship with the client allowing for an effective and efficient decision making process. One of the biggest challenges was the tight deadline for delivery, driven by the client’s desire to have the building completed for the 2009 Abu Dhabi Formula 1 Grand Prix. To help meet the deadline, precast columns, stairs, landings and factory assembled toilet modules were widely employed to maximise off-site construction and accelerate the erection program on site. The use of advanced 3D modelling and a close and productive collaboration between Arup and its project partners were also key. The project also adopts a subterranean vacuum waste collection system which transfers the waste directly to a local waste transfer station for recycling and compacting, eliminating the need for refuse collection vehicles. This system is the first of its kind in Abu Dhabi. With the identity and success of the building being driven from the purity of the form and speed of construction, the façade engineering team at Arup were instrumental in setting the geometrical rules for all other disciplines at a very early stage. The façade geometry resolution extended even to the positioning of the piled foundations in order to ensure that the façade contractor had an uninterrupted zone in which to create the building skin. By understanding this geometry coupled with how systems can be designed with unnoticeable varying joint widths, Arup was able to reduce the number of individually sized glass panes by a factor of 1,000. This resolution also enabled all floor edges to be set out using a simple circular geometry allowing both quicker construction but also greater ease for the tenant fit out. The concept of the building maintenance unit (BMU) was developed by Arup with the introduction of a single machine from which three cleaning teams can work at once to cover the areas as required to keep the building free from the desert sand and dust. In addition, energy efficient variable air volume (VAV) cooling systems, energy efficient light fittings and controls and water efficient sanitary fixtures were used. This unique shaped building was produced with a very high efficiency of Nett/Gross area. Aldar headquarters building is the first circular building of its kind in the Middle East. It is located in Al Raha, Abu Dhabi (emirate), United Arab Emirates. The distinctive building was voted the &ldquo;Best Futuristic Design&rdquo; by The Building Exchange (BEX) Conference held in Spain. The shape of this building is achieved through the use of structural diagrid, a diagonal grid of steel. The groundbreaking building represents a fusion of tradition and modernity, with the striking circular shape symbolising unity and stability. The building&rsquo;s diagrid concept largely eliminates the need for internal columns, which would compromise the aesthetic appeal of both the external building as well as the views from within. This steel diagrid is the first of its nature in the UAE and showcases Arup&rsquo;s leading edge approach to structural design in the region. The project was developed in line with the US Green Building Council LEED rating system. One of the biggest challenges was the tight deadline for delivery, driven by the client&rsquo;s desire to have the building completed for the 2009 Abu Dhabi Formula 1 Grand Prix. To help meet the deadline, precast columns, stairs, landings and factory assembled toilet modules were widely employed to maximise off-site construction and accelerate the erection program on site. The use of advanced 3D modelling and a close and productive collaboration between Arup and its project partners were also key. Indeed it was very nice to read about this article on the features of this distinctive building. I had seen this marvelous building while travelling to Abu dhabi. I would appreciate if you could throw light on the structural aspects of the building such as its detailed structural dimensions and the layout of beams and columns. I also saw this building when I visited Abu Dhabi recently and took a few pictures. This only prompted me to collect the info. and post it in SEFI. I have a doubt regarding the example given in the castellated section in design of steel structures by Dr.subramanien, in that example 10.16, can u please tell me how zz and Iz is calculated I tried so many times am not arriving with the exact answer please clarify me sir.